The term “libertarianism” is used in two senses in philosophical circles. The first, and perhaps more famous sense, is as a name for a family of political theories that prioritise individual freedom; the second, and perhaps less famous (except among the cognoscenti), is as a specific view on the nature of free will. It is the latter sense that concerns me in this post. As a view about the nature of free will, libertarianism is committed to both the existence of free will, and the incompatibility of free will with causal determinism. Consequently, it is to be contrasted with compatibilism — which holds that free will exists and is compatible with causal determinism, and hard incompatibilism — which shares with libertarianism the belief that free will is not compatible with determinism, but adds to this the belief that free will does not actually exist. Event Causal Libertarianism: This version assumes a standard scientific account of causation, according to which events cause other events. It thus takes it as a given that human actions are caused by agent-involving events, i.e. beliefs, desires and intentions of agents. In this respect, it seems entirely deterministic. It takes on a libertarian edge by holding that the agent-involving events include an element of indeterminacy. In other words, the beliefs, desires and intentions are not themselves sufficient for causing (truly free) human actions. A degree of indeterminacy must be added to the mix in order for the agent to have free will. 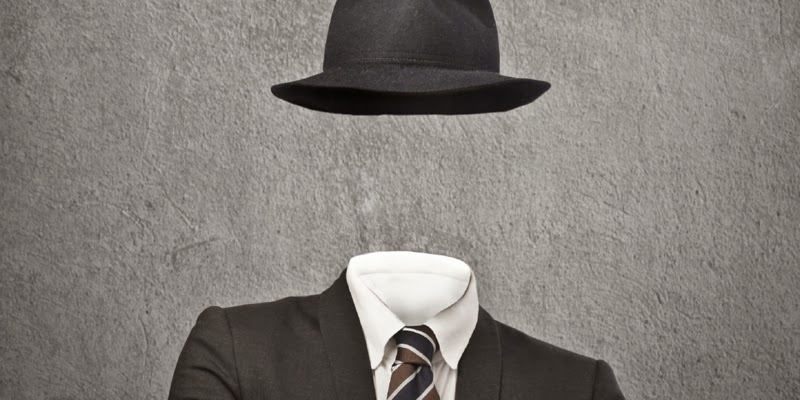 Agent-causal Libertarianism: This version assumes that agents exist as distinct metaphysical substances and that they can cause decisions to be made without themselves being caused by anything else. This is a metaphysically exotic view as it must account for the existence of agents apart from (or emergent from) ordinary material and physical causal forces. Nevertheless, it has been quite popular in the history of Western philosophy. Non-causal Libertarianism: This is probably the most unusual version of libertarianism. It assumes that conscious agency is non-causal in nature and that all application of causal language to mentality and agency is metaphorical and ultimately misleading. It goes on to hold that certain other noncausal conditions must be satisfied in order for an action to be free. These conditions often focus on the phenomenology or teleology of the action. Because it is the version of libertarianism that works most closely with the scientific understanding of human behaviour, and because I find it to be the most interesting, I want to focus on event-causal libertarianism in the remainder of this post. Again, I will do so by using Derk Pereboom’s critique of the view in his recent book Free Will, Agency and Meaning in Life. I’ll run through Pereboom’s basic criticism — the disappearing agent objection — and then I’ll follow up by looking at Mark Balaguer’s attempt to rescue event-causal libertarianism. Pereboom is a proponent of the sourcehood view of free will. According to this view, in order for us to say that an agent’s decision is free (in the sense required for moral responsibility) we must be able to say that the agent was the source of his or her decision to act. That is: the decision must (somehow) belong to, or be attributable to, the agent. For what it’s worth, this is a view to which I am highly sympathetic. I have long taken the position that attributing an action to an agent is what matters when it comes to moral responsibility; not whether that agent “could have done otherwise”. The sourcehood view poses a problem for event-causal libertarians. Some of them are happy to accept that certain decisions are causally determined. For example, Robert Kane is a famous event-causal libertarian who is willing to accept that many of the decisions we make on a day-to-day basis are causally determined by other decisions we have made, or by our personalities, traits and dispositions. In these cases, it is plausible to suppose that the agent is the “source” of the decisions. But where Kane diverges from the deterministic view is in holding that truly free decisions — decisions to which our responsibility must ultimately be traced — will not be causally determined by features of our personalities, traits and dispositions. Instead, these truly free decisions will involve some element of indeterminacy. For Kane, the truly free decisions occur when agents experience some conflict of wills. Imagine you have a really difficult decision to make: should you accept a new job in a faraway place, away from your friends and family, or should you stay where you are. Suppose, further, that there are good reasons for either decision. Suppose these reasons are equally weighted or incommensurate. In other words, they do a good job of pulling you in both directions without allowing for any decisive reason on either side of the equation. Nevetheless, you eventually do make a decision. In those moments, there is some indeterminacy — the agent-involving events (moral and prudential reasons, beliefs, desires etc) do not causally determine the decision — and in those moments there is true freedom. Kane and other event-causal libertarians also often try to show how this view is compatible with the indeterminism of modern physics, e.g. by suggesting that there is some degree of quantum indeterminism inherent in the brain mechanisms underlying human decision-making. (1) Event-causal libertarianism assumes that indeterminacy is needed in order for an agent’s decision to be truly free (i.e. that the agent-involving events leading up to a decision cannot be sufficient for the decision itself). (2) The sourcehood view requires that in order for a decision to be free, something about the agent must settle the question of whether a decision is made or not, i.e. the decision must have its source in the agent. (3) If the agent-involving events leading up to a decision are insufficient for the decision, then nothing about the agent settles the question of whether the decision is made or not. (4) Therefore, event-causal libertarianism is not compatible with the sourcehood view. (5) But the sourcehood view is correct (previous argument). (6) Therefore, event-causal libertarianism must be false. This is called the “disappearing agent objection” because it suggests that if event-causal libertarianism is true, the agent disappears from the causal chain leading to the decision. The decision can no longer be traced or attributed to the agent in the appropriate way. 2. 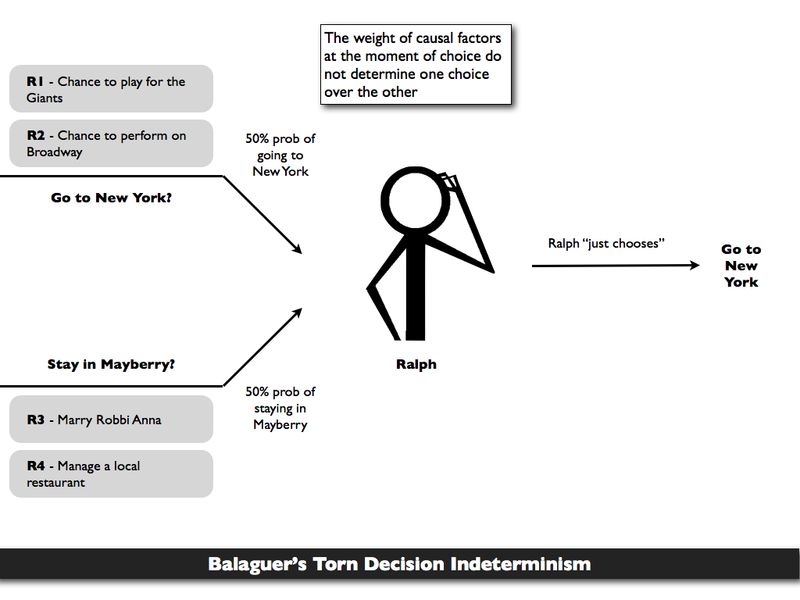 Can Balaguer’s account of Torn Decisions save the event-causalists? Pereboom intends the disappearing agent objection to be a general objection to all versions of event-causal libertarianism. In his original work he specifically targeted Robert Kane’s event-causalist account. 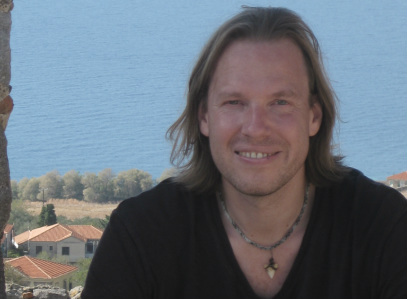 In his more recent work, he focuses on Mark Balaguer’s account. This is for a good reason. Balaguer’s account is the most sophisticated and up to date defence of event causalism, responding to many of the standard objections and trying its best incorporate modern scientific discoveries (he calls his book Free Will as an Open Scientific Problem). Pereboom reasons that if Balaguer’s account is also vulnerable to the disappearing agent objection, there is little hope for event causalism. Torn Decision: A decision in which an agent (a) has reasons for two or more options and feels torn as to which set of reasons is strong, i.e. has no conscious belief as to which option is best; and (b) makes a decision without resolving this conflict — that is, the agent has the experience of “just choosing”. Libertarian Freedom (L-Freedom): If a torn decision is wholly undetermined, then it is L-free — that is, it is not just undetermined but also appropriately non-random, and the indeterminacy increases or procures the appropriate non-randomness. TDW-Indeterminism: Some of our torn decisions are wholly undetermined at the moment of choice, that is, the moment of choice probabilities of the various reasons-based tied-for-best options match the reasons-based probabilities, so that these moment-of-choice probabilities are all roughly even, given the complete state of the world and the laws of nature, and the choice occurs without any further input, that is, without anything else being significantly causally relevant to which option is chosen. This might be a little obscure and technical in the abstract. Fortunately, Balaguer uses an example to ground his analysis. The example involves a man named Ralph who has to decide whether to stay in Mayberry or move to New York city. The reasons that count in favour of moving to New York are that he wants to play for the Giants and star on Broadway. The reasons that count in favour of staying in Mayberry are that he wants to marry his sweetheart Robbi Anna, and manage a local restaurant. In the end, Ralph decides to move to New York. In this case, there are four agent-involving events that could causally determine his decision: the two reasons in favour of going to New York and the two reasons in favour of staying in Mayberry. But these events are in a perfect equilibrium: they do not decisively support one choice over the other. Furthermore, no other external causal factor intervenes to tip the balance in favour of one decision or the other. The state of the world prior to the decision is not causally sufficient for either option. Nevertheless, Ralph breaks the deadlock by just choosing to go to New York. He is thus responsible for the decision through his choosing. Nothing else. In this way, we have an indeterminate set of events leading up to the decision and a decision that is attributable to nothing other than the agent. So much for Balaguer’s account. Is it any good? Pereboom is suspicious. As am I. I’m not even sure that the kind of scenario Balaguer imagines is plausible or possible, though this may be because of some strong methodological naturalism on my part. I have a very hard time imagining a case in which the total set of causal factors external and internal to the agent would be insufficient for determining an action and yet nevertheless we would still be entitled to say that the agent made the decision in the sense demanded by the sourcehood view. If an agent simply is a set of events (a set of reasons, desires and beliefs etc.) then according to Balaguer’s thought experiment, there is still nothing about the agent that settles whether a decision was made or not. On the other hand, if an agent is not a set of events, then I’m left wondering what an agent is. It would seem like, in that case, Balaguer’s account simply tips over into the agent-causalist or non-causalist camp. And both of those views have their costs. Agent-causalism involves some pretty exotic metaphysical assumptions about the existence of agents qua substances, set apart from the material, causal world; while the non-causalist account borders on incoherence. What’s more, Balaguer disavows those approaches in his own work. So that can’t be what he wants. In the end he seems to be left with a bit of a dilemma: if he follows event-causalism about agents, then his account is still vulnerable to the disappearing agent objection; if he doesn’t follow event-causalism about agents, he ends up with a different account of libertarianism. The problem can be seen more clearly if we consider Balaguer’s response to something called the “rollback objection”. What if we were to roll the clock back to the moment when Ralph made his decision? What if we were to do this over and over again? Suppose we do it 100 times. What would we observe? If the decision is truly indeterminate, then we should probably expect to see Ralph choosing to go to New York 50 times and choosing to stay in Mayberry 50 times. If there was some bias in one direction or the other then the world wouldn’t be in the kind of causal equilibrium Balaguer imagines. But if we did observe that 50-50 pattern, aren’t we right to say that the decision to go to New York is simply a matter of chance? There is nothing about the decision that we can really attribute to Ralph. At least not in the sense that Ralph is the source of the decision. The decision could just as well be attributed to a random coin toss. Balaguer responds to this by re-emphasising his point about Ralph “just choosing”. He claims that, if in each of these 100 cases, Ralph consciously chooses one of the options, without being causally influenced by anything else, then the decision can be attributed to him in the sense required, even if we observe this 50-50 split. But as Pereboom points out, it’s no good simply stating that it is Ralph that “just chooses” to go to New York in all of these cases. We are owed some coherent account of how it is that Ralph just chooses one option 50 times and the other option 50 times, without falling into determinism or one of the other non-event-causalist views. It’s hard to see how Balaguer can manage this. As a result, we can probably conclude that event-causal libertarianism is unable to avoid the disappearing agent objection.